Bharatanatyam பரதநாட்டியம் is a classic dance form originating in Tamil Nadu, a state in Southern India and is also the National Dance of India. This dance form denotes various 19th and 20th century reconstructions of Cathir, the art of temple dancers. Cathir in turn, is derived from ancient dance forms. Bharatanatyam is usually accompanied by the classical Carnatic music. Bharata Muni, the author of the Natya Shastra ancient treatise on classical Indian dance. The word Bharatanatyam is composed of three terms, Bha meaning Bhava or abhinaya expression, Ra meaning raga and Ta meaning tala . In other words, the dance form is a communion of expression, melody and rhythm. The oldest of all the classical dance forms in India, Bharatnatyam is also known as the fifth Veda. In the ancient times, it used to be performed by the Devadasis in the temples of Tamilnadu as 'dasiattam'. The postures of the Bharata Natyam dance of India have served as an inspiration for the ancient sculptures in Hindu temples. The postures of the celestial dancers depicted in the scriptures were given the name of Bharatanatyam Mudras on earth. 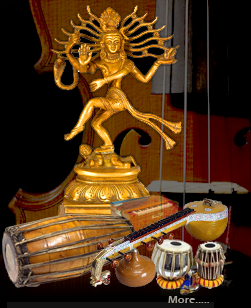 The spirit of Bhakti has been deeply ingrained in Bharata Natyam and it mainly features mythological stories. The credit of bringing Bharatnatyam to its present form goes to the famous quartet of Chinnayya, Ponniah, Sivanandam and Vadivelu of the Tanjore Court. The various forms of the dance, like Alarippu, Jathiswaram, Sabdham, Varnam and Tillana, were also introduced by them. Even the first dance teachers of Bharatanatyam in Tanjore were the descendants of these four brothers only.